There are many advantages to growing on recirculating systems. On the other hand, this growing method requires great precision and a close monitoring of the nutrients and the plants. Cultivation without soil in recirculating systems offers great advantages to the grower. The most important benefits are the high degree of control, more efficient water consumption and the lack of substrate waste (NFT). However, the drawback is that recirculating systems require more management. This stems from the fact that changes can occur rapidly in recirculating systems; the nutrient directly influences the crop and vice versa. Acting too late or incorrectly will have direct, rapid negative consequences. Compared with cultivating on substrates with high nutrient and water buffers, such as potting soil or coco, recirculating systems require closer monitoring of the nutrient and the plants. Since these cultivation systems contain little to no nutrient buffer, changes to the nutrient solution have a direct impact. The plants react to the nutrient solution incredibly fast: within a single day, a healthy looking plant can wilt from a lack of water. The plants and nutrient must therefore be observed and checked regularly. Naturally, proper nutrients are indispensable for achieving good results, but there are other factors involved. The nutrient reservoir in recirculating systems must be checked regularly and topped up, or renewed, when necessary. This is necessary to prevent shortages and build-ups of salts. The frequency with which the solution has to be renewed depends on how intensive the cultivation process is and the size of the nutrient reservoir. The nutrient reservoir must contain at least 5 liters per plant. The more nutrient there is available for the plants, the smaller any fluctuations in the pH and EC will be. Under normal circumstances the nutrient should be renewed every 7 to 10 days. If the nutrient is not renewed in time, the desired balance between the different nutritional elements will be severely disrupted. Nutritional elements such as calcium, magnesium, sulpate, sodium and chloride will build up first. This can happen without affecting the EC! The elements nitrogen and phosphate will be exhausted first, which can cause shortages. These are visible on the larger leaves, which can turn completely yellow (nitrogen shortage), or will show purple spots (phosphate shortage). Build-ups of sodium and chloride will slow down growth. 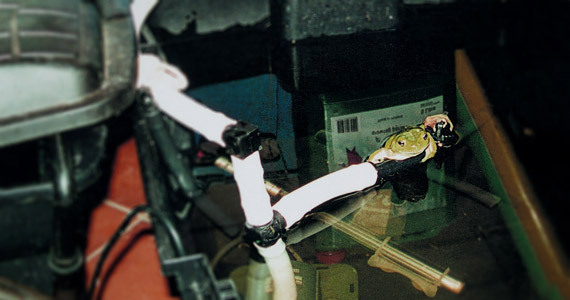 In Nimbin Australia, frogs live in the nutrient reservoir. The nutrient reservoir needs to be regularly topped up to its original level in between the days on which the nutrient solution is renewed. Start topping up when 25 to 50% of the nutrient solution has been used up. It is best to use a solution that is approximately half as strong as the original nutrient solution. In circumstances where evaporation is a concern, the reservoir is best topped up with tap water. This can be the case when the temperature is high and humidity is low, for example. In this way, evaporation can take place easily while the nutrient solution’s EC is prevented from rising. Given the fact that the nutrient solution has to be renewed regularly, this is not, strictly speaking, a sealed system.